Here's another take on homemade tortilla chips. You must've figured out by now that I like my nachos. Unfortunately, tortilla chips are pretty hard to come by in stores around here. And when you do find a packet, their either insanely overpriced or terribly salty and full of artificial stuff you don't want to be putting into your system. So a while ago I'd made some Nachos, from scratch. I was pretty happy with the way it turned out. The only thing that I wasn't thrilled about is that the tortilla chips were roasted on the griddle and then deep fried, meaning, lengthy process, not to mention I found the chips absorbed more oil than I'd have liked. So when I was browsing through my recipe book collection the other day, I came across another take on tortilla chips by Nita Mehta. So I said why not give it a try. Here you deep fry the dough directly. I must say, I was really pleased with this take on homemade tortilla chips and I know for a fact that this will be my go to recipe in the future. For starters, the process was considerably shorter that the first version. These chips can be made ahead of time and stored in an airtight container. They don't absorb much oil and are nice and crunchy. A note of caution, these are so darn good, you won't be able to stop munching on them just the way they are. We went though half of the quantity without even making a single portion of nachos with them. They make fantastic nibbles. Knead into a pliable dough with water. Make large marble sized portions and roll them out into thin discs. Prick it all over with a fork. Heat some oil in pan and deep fry on a medium flame till they turn golden brown in color. Drain them off on some absorbent kitchen paper. When they've cooled off completely, store in an air tight container. Hmmm. We've made potato chips, but I never thought to make my own tortilla chips. Sounds pretty straightforward and they look delicious. :) Visiting from Rook No. 17. Never thought of making my own chips before! They look just as good as the ones you buy and maybe even better! Thanks a lot for sharing this wonderful recipe of tortilla chips. Your chips look really good.I have never heard of carom seed before - off to research it. :) Thanks for sharing your recipe with The Hearth and Soul Hop. Thank you all for your kind words. I hope you enjoy them as much as I do! 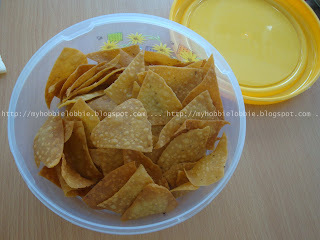 I'm a HUGE tortilla chip fan and will make these asap! This looks so easy and I bet they're wonderful. I had to chuckle to myself because I consider when I take store bought tortilla wrappers, cut them and fry them up as "home made". Guess I have some rethinking to do! Thanks for stopping by Lisa. Your homemade version is healthier than the packaged chips too! Atleast you know for sure that your not ingesting stuff that you can't even pronounce :) ! I love my nachos too! Your chips look incredible! They look like the ones we get from our most favorite Mexican restaurant here in town. I'm curious about the carom seeds. What do they taste like (they add something wonderful, I'm sure). Thanks Jen, actually carom seeds are pretty similar to thyme or caraway seeds flavorwise, but have a little more bite and pungency. Hi Trina, I haven't really tried only using maize flour, so really don't know if the outcome will be the same. So if you do try it, I would suggest making a small batch first to see how it works out. Let me know what happens, I'm eager to know if this can be converted to a gluten free recipe.